Through the years, we have had the opportunity to work in many of the finer banquet halls located throughout the state of New Jersey. While our company is based in the Princeton area in central New Jersey, we perform across the state, from Cape May to Bergen County. That said, our selected 'best venues' are skewed towards Central NJ and the Jersey Shore. * Well-maintained facilities - are the lobby, bathroom and parking lot clean and well-maintained? If a facility doesn't care about its appearance, will it care about your once-in-a-lifetime celebration? A bonus factor is a venue whose staff treats the DJ as a valued member of the 'wedding team' and not as an unwelcomed intruder! Pick the Perfect Wedding Venue and You'll Be All Smiles! 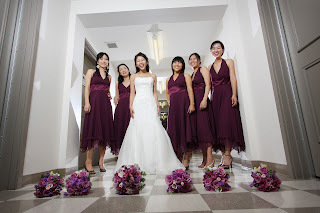 * Ask your wedding planner, DJ company or other wedding vendors for recommendations. In countdown fashion, here is a list of our 15 favorite wedding venues in the state of New Jersey. Next to each venue, we have listed a description about what makes it special and a link to the venue's website. The ultimate question was - which New Jersey venues would we consider for our own weddings? 15. Surf City Yacht Club - Long Beach Island. This summer beach club fronting Barnegat Bay is the perfect location for a Jersey Shore wedding. The management goes above and beyond in attending to its guests. (www.scyc-nj.org). 14.Tim McCloone's Supper Club - Asbury Park. Located on the newly renovated boardwalk in Asbury Park, this modern, Manhattan-style dinner club is the perfect choice for an intimate gathering with a live jazz trio or other musical act onstage. (www.timmcloonessupperclub.com) McLoone's Pier House in Long Branch also deserves an honorable mention, with the ability to stream fresh sea air into the party room. 11. The Mill at Spring Lake Heights - Spring Lake. I am particularly fond of this venue having worked there through high school and college when it was formerly the Old Mill Inn and owned by restauranteur Joel Amiel. Amiel ran a tight ship and knew how to produce a superior food and service experience that has carried over to this day. Have your ceremony outdoors on the lake with the beautiful swans swimming nearby (www.themillnj.com). 8. The Smithville Inn - Galloway Township. Located close to Atlantic City, the Smithville Inn has a rustic, country feel - with white brick walls, dark hardwood floors and wooden beams. The view from the dining room is of a picturesque lake, and don't be surprised if you cross paths with an exotic mallard strolling about. A perfect venue for an intimate gathering among your closest friends and family (www.smithvilleinn.com). 1. Clarks Landing Yacht Club - Pt. Pleasant, NJ. With a new luxurious ballroom with high ceilings and panoramic windows fronting the water, a top notch management team and delicious food, Clarks Landing is our standout selection. An added plus is that DJs plug their board into an in-house sound system with speakers built into the ceiling above the dancefloor. The result is that dancers enjoy louder music, while those dining on the perimeter are not blasted out of the room. Regarding the management, we were once setting up while the staff had its prep meeting - its attention to perfection was impressive! (www.clarkslandingcaterers.com). Comments are welcomed, and please let us know what venues would be on your list! After selecting the perfect venue to celebrate your wedding reception, start your research for the perfect music and entertainment to compliment your venue at Ambient DJ Service (www.ambientdj.com). Ambient DJ Service is an award-winning mobile DJ entertainment company that specializes in weddings, and enjoys customizing music and entertainment for cool couples. so many reasons to wedding here really a nice place for wedding as well as honeymoon.